Despite the waves of pumpkin ales and lagers appearing on shelves and tap lists around town, I’m afraid I’m just not ready. 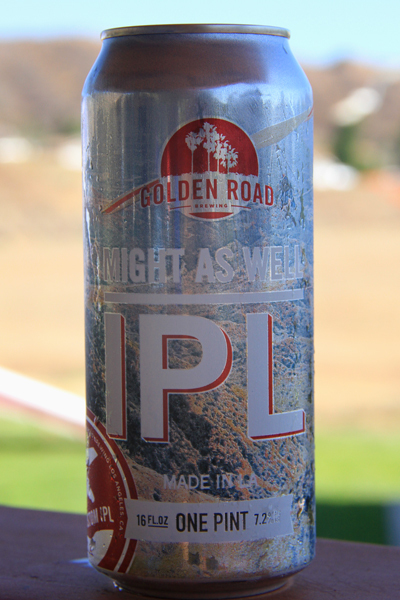 In this Indian Summer heat I just can’t yet embrace the flavors of fall, and therefore welcomed the chance to try a new hoppy lager from Golden Road Brewing; Might As Well IPL. I’m a firm believer that anything that is handed to me in a can should be drank that way, but when poured into a glass, Might As Well IPL has a super clear straw body akin to its cousin 329 Lager. Both beers use the same house lager yeast. The head is a rocky ultra-white and dissipates very quickly leaving light lace throughout the glass. Nose has fragrant tropical fruit tones and a distinct dry hop aroma from the brew’s Galaxy and Calypso hops. Taste follows suit with tropical fruit, fresh hops, and a lightly spiced back end with ample citrus rind. Mouthfeel and body are appropriate for an easy going lager, lighter than the MoHop for example, but still gives the best of both worlds. Though the brews body is decidedly lager, its ABV is on the IPA side, coming in at 7.2%. Always coming up with fun ways to unveil new brews, Golden Road chose the annual Dahlsten Cup held by the Sylmar Hang Gliding Association to celebrate the arrival of Might As Well IPL. What’s the connection? Rob Burgis, father of Golden Road CFO Paul Burgis, is the former president, current member of the association, and an adventurous handglider who has successfully glided back to the Sylmar landing strip from as far as Big Bear. Fans of Golden Road’s 329 Lager and Point The Way IPA will find this hoppy addition to the line-up a pleasant middle ground. Crisp, light, and refreshing with hops to spare and a balanced overall flavor. This entry was posted in Beer For The Masses. Bookmark the permalink.